Good morning gals! Well it has been a busy week around the blogging world, if you caught the Royal Blog Tour, there were some amazing projects posted. If you missed it, stay tuned, there will be another one soon, I'm sure! First of all, I want to take a minute to welcome Sandi MacIver to our design team. Sandi has some AWESOME ideas on her blog, be sure to check her out! 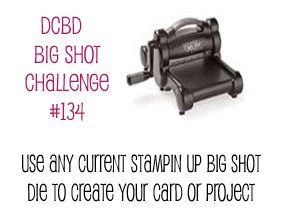 Our challenge this week is once again the Big Shot challenge. I know for some it is difficult to do, but we gain so much from everyone participating - so we hope to see what you come up with, this week. There are no samples on this main page this week, you'll have to click on the links to the right to visit our Diva's. Be sure though, to come back and post whatever you've created by leaving your blog link using Mister Linky below. Heidi and I hope you all have a blessed week this week, and we'll see you next week with an amazing sketch challenge! Here is our version of this challenge. We are in the midst of gathering the new divas up and getting everyone in line to be posting every week here on the blog, so please bare with us and instead of seeing the cards here on the blog, go to their blogs on the right side and share with them what you think about their cards. Please link your pic to Mr Linkey and we will check out what your take is on this sketch. Is this not the coolest color combo you have seen in a while? Well that was what I thought once I started playing with the colors and put them all together. 5 colors seems like alot but the black is just and added color that can be very minimal. We are finalizing our picks for the next couple of Diva's that will be joining our team so stay tuned to who will be the next reigning DIVA for the next 6 months. We would love for you to check out the other divas designs also and play along and upload your pic to our Mr Linkey. If you don't have a blog, we will be happy to upload your pic here for everyone to see. Hello Stampers its another Wednesday and we have new In Colors and a New Catalog. I hope that you all will be showing us your new supplies. We are still looking for our NEW Diva's so if you would like to be a DIVA and on our Design Team then please just email me or Julie and we will be happy to talk with you. Upload your card to Mr Linkey and we will do a drawing for you to be spotlighted on our Blog next week!! Thats right, YOU will be a Spotlighted DIVA!! Good morning gals!! This is the morning we've all been anxiously waiting for!! Stampin' Up! has released its newest catalog today!! Our Challenge today is to use the Big Shot, but also try to use items out of the new catalog! Here is Tammy's card, as you can see, she's used the Butterfly die cut with the Big Shot as well as some of the new DSP with the In Colors on it! Be sure to check out Tammy's blog for more details...her blog is below. As always, if you've participated in the challenge, be sure to come back and click the Mister Linky link, and add your name and blog address so we can come to see your project as well! All of the Diva's have worked hard on their cards, you can see them, but clicking the links to the right of the post. We hope you all have a blessed week!